It's like me leasing an Acura and telling my son it's a generational asset. What does ACURA stand for? ACURA stands for "Another Crummy, Useless, Rotten Automobile"
How to abbreviate "Another Crummy, Useless, Rotten Automobile"? What is the meaning of ACURA abbreviation? 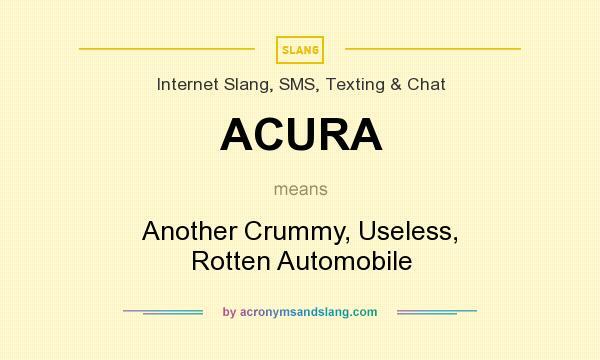 The meaning of ACURA abbreviation is "Another Crummy, Useless, Rotten Automobile"
ACURA as abbreviation means "Another Crummy, Useless, Rotten Automobile"